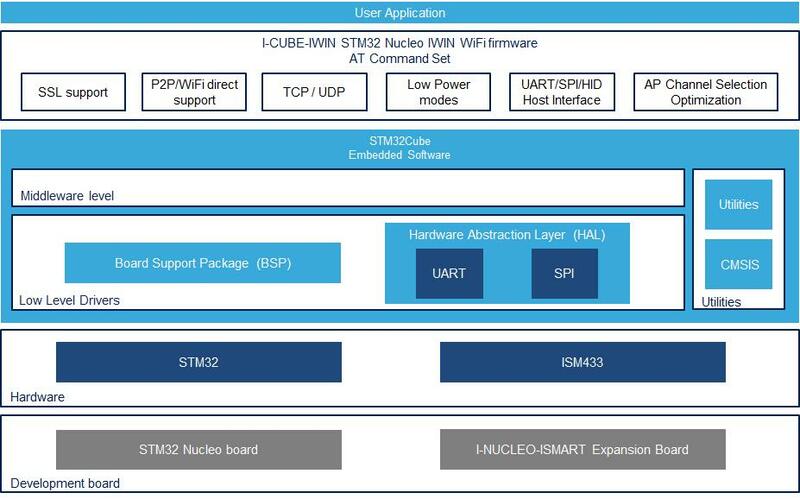 IWIN "AT Commands for IoT"
The whole ISMART Design Environment includes the comprehensive STM32Cube HAL library together with various packaged software examples, as well as a direct access to the STM32Cube IWIN Wi-Fi firmware. To get more details, please refer to the I-CUBE-IWIN webpage. 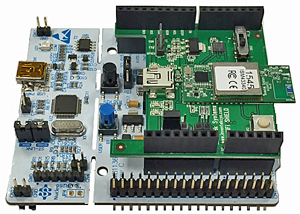 The STM32 Nucleo ISMART IoT development platform consists of an Inventek Arduino compatible shield, able to embed each of Inventek’s eS-WiFi modules for maximum flexibility between a wide range of combo radio options (including BT/BTLE and/or NFC), designed to be compatible with all of the STM32 Nucleo boards. Inventek’s eS-WiFi module portfolio also enables customers to migrate between any/all module options without any board layout changes due to their standardized L44 foot print for all of the eS-WiFi modules offered. The Inventek ISMART platform enables customers to quickly launch IoT products based on ST microcontrollers and Broadcom’s Wi-Fi radios. The robust user friendly Inventek AT command set FW, IWIN (Inventek Wireless Interoperability Network), makes it easy to take any STM32 Host microcontroller and communicate with any Inventek eS-WiFi (embedded Serial Wi-Fi), module, thus allowing customers to quickly get a Wi-Fi connected application up and running. The STM32 Nucleo ISMART (Inventek Systems Module ARduino Test) Wi-Fi platform is a user-friendly design kit suited for all of your IoT application needs. 802.11 b/g/n & a/b/g/n Compatible based on Broadcom’s MAC/Baseband/Radios. Configurable though IWIN AT commands.